Building your own bug out bag (BOB) can be expensive. The best thing is to slowly build it up over an extended period of time. This way you can get the best gear in your bag. However, if you’re like me you don’t want to wait and/or you also don’t have lots of money to spend on luxury survival gear. Luckily is isn’t too difficult to put together a budget bug out bag. It’ll take some research and leg work, but you’ll save lots of money. Create a list of all the items you need first. Remember that we’re on a budget so now is not the time to fantasize what would be nice, but rather what is essential to survive. REI goes into more detail regarding each category, but I like to keep it simple. Let’s look at each one below. If you already have a GPS, that’s great! Bring it along. If not, don’t go buy one solely for your bug out bag. Furthermore, learn how to use a compass with and without a map. Try to get one with an adjustable declination and viewing mirror (doubles at signal mirror). More than likely you already have these items so we’re ahead of the game. If not, be sure to include them in you budget bug out bag. Ensure that the sunglasses and sunscreen block UVA and UVB rays. Also, I understand this is a budget BOB, but do not cheap out on sunglasses. Crappy lenses will cause more damage to your eyes than not having them at all. It will depend on the season to determine what exactly to bring, so this will be up to you. Keep in mind that extra underwear and socks are a must. If it’s cold then think lightweight, mid, to heavy fleece long sleeve shirts. Long underwear, warm gloves, warm hat and/or balaclava, coat, etc. Wool is the best material (although expensive), so a synthetic blend will be fine. Avoid cotton! It may not be possible to have all three, but you need at least one light source. Look for lightweight, LED, durable, and strobe mode (for emergencies). Headlamps are great because they offer hands-free use. If you can only have one go for a headlamp. Don’t forget the spare batteries! You can build you own kit or buy a pre-made one, up to you. You want each of the above. Lint and/or cotton balls soaked in Vaseline are by far the most budget friendly fuel source. You can’t always rely on nature to provide perfectly dry tinder. See the guide on creating your own fire starter kit. Knives are a must, ideally have a fixed blade full tang knife and an every day carry (EDC) folding pocket knife. See our guide on how to choose the best survival knife. Your multi-tool should have at least a fold out blade, flat head screwdriver, can opener, and scissors. Duct tape has a million uses. Be sure to carry some with you in case you need to repair clothes, bags, tents/tarps, etc. Wrap around your water bottle or expired credit card instead of bring the whole roll. Bring what you need for your journey plus one day (just in case). Freeze-dried meals, Mr. Noodles, energy bars, nuts, dried fruit, jerky, etc. The best is food that doesn’t require lots of preparation. Water purifier tablets and/or filter (Lifestraw, Sawyer Mini, etc). Estimate 1 L of water per day as a bare minimum. Set up camp near a stream for a continuous source. Try to carry one of each, if it’s not possible go with the bivvy sack and tarp. The tarp has many uses such as shelter creation, and the bivvy sack will allow you to crawl inside and stay warm (reflects up to 90% of your body heat back to you). A contractor grade large garbage bag has many uses, so try to include one! Now that you have an idea of what you’re looking for, this is where the fun begins! You get to now shop around for your budget bug out gear. Amazon has some of the best prices around, but I actually found that Canadian Tire had some of the same items I was interested in for a few bucks less! Also check out Walmart and dollar stores, you’d be surprised at what your local dollar store may have. The smaller items like zip-loc bags, lighters, matches, etc. I’ve found at every dollar store I’ve been to. Furthermore, the bonus with shopping locally is that is you don’t have to wait on shipping! And of course supporting local businesses. Don’t be afraid to shop at your local military or camping surplus store for great discounts on used gear. Some may offer gear swap nights so be sure to ask if that’s something they do. Also, while you’re perusing online check Kijiji, Craigslist, and eBay every so often. You might get lucky and pick up a lovely used item at a discount. Last time I looked in my area there was nothing, but that doesn’t mean there won’t be anything the nest day. Remember to be safe when meeting up with strangers. Being on a budget isn’t a bad thing. Will your Walmart knife last forever, definitely not, but I’d rather have something than nothing. The bug out bag is for emergencies only, not your everyday camping bag. I’ve looked into many BOB builds and it’s crazy the amount of money people are spending on their BOB, something which they may never need to use. In conclusion, use the list at the top of this article so you have the absolute basic essentials. Some items you may already own, so you’ll save some money there! Don’t spend money you don’t have on things you may never use. Always be prepared no matter what, and it’s okay to prepare frugally. The backpack you use for your BOB is up to you, make sure it fits your gear and is comfortable to wear. Below is a great video showcasing what you can accomplish when creating a budget bug out bag. (Note, the prices in the video are in USD and even the cheap stuff in Canada isn’t that cheap). 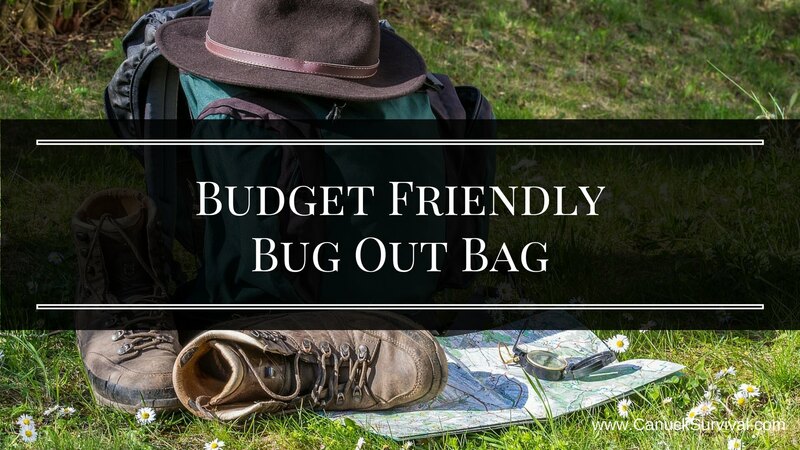 Have you built a budget bug out bag or have any suggestions, questions, or advice. Leave a comment below!